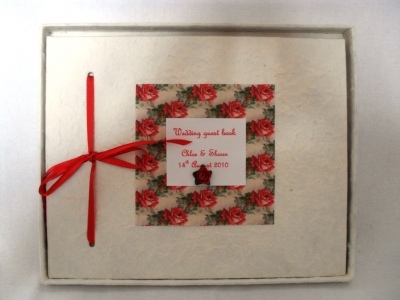 A romantic wedding guest book decorated with a red rose patterend design complete with a single red rose to the centre and red silk ribbon. A perfect book to allow your guests to leave their messages on congratulations and a lovely keepsake to remind you of a wonderful wedding day. Comes in a box with a clear lid.